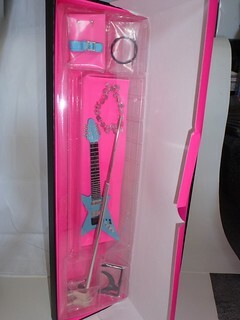 Her accessories include a pair of earrings, a pair of extra hands, stand pieces, her electric guitar with strap, and an oversized metallic belt that closes with a hook-and-clasp. Thanks to Aja’s pale skintone, her glamorous 80s make-up is quite visible. 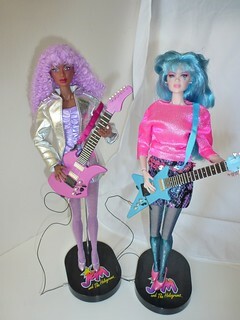 Some of the other dolls (like Jem and Kimber) have comparatively subdued make-up, but Aja pulls out all the stops with her pink eyeshadow and her blue lightning bolts and stars. 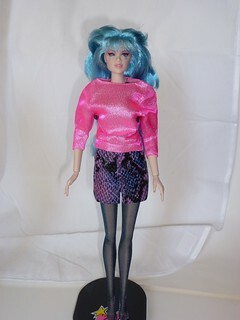 Although I’m not entirely sold on her boat-neck spangly pink 3/4-sleeve sweater with the banded bottom, I love her faux-snake skin mini-skirt and her gorgeous iridescent midnight-blue tights, which shimmer and sparkle. Aja’s hair is an interesting multilayer affair. 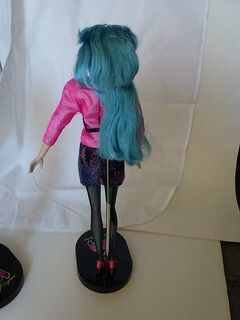 It looks just a little longer than shoulder-length from the front, but is mostly waist-length from the back. I personally prefer the shorter look, but I can see a variety of styling options for Aja. 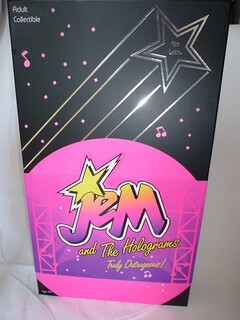 Hopefully Integrity Toys will do right by the Holograms and release the final member, drummer Raya Alonso. I’m sure they’ll do a great job!